A motorist was caught on camera going the wrong way round a busy Peterborough roundabout last night, Sunday April 17. The footage, captured on a dash cam was taken at 6.38pm and show a blue hatchback driving the wrong way around the Boongate roundabout junction. The car then does a U-turn in the slip road exit of Frank Perkins Parkway. 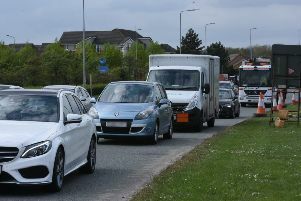 The incident was captured by Richard Farr who said: “It’s an unbelievably stupid bit of driving on one of the busiest junctions in Peterborough. “Sheer stupidity and shockingly dangerous. Driver comes round the wrong way on a very busy roundabout into oncoming traffic, stops with 30mph drivers coming around the roundabout blindly, and proceeds to do a U-turn in front of me. A police spokesman said: ““We would like to remind motorists of the importance of adhering to the rules of the road.